(4/10) I was recently planning my next vacation. Should I lie on the beach for a week? Or go hiking in the mountains? Or maybe it's time to plan a trip that I've been putting off for years. This got me thinking about the places I'd really, really like to get to before it's too late and I decided to put a list together. Now, this is a highly personal list, so not everybody may agree with my choices. There's nothing here in North America, because I've already had the privilege to travel widely through the United States and Canada. I also decided to limit my choices by selecting only what I consider to be mysterious historical locations as opposed to intriguing natural sites. In addition these locations should be only those that could be visited by any healthy adult for a reasonable cost (so searching for the Yeti near the summit of Mt. Everest is not on the list). Each entry includes why I want to go there, about how much it would cost and why I think it is important enough to go on the list. I calculated airfare from NYC because it is close to my house, but of course this will vary for you if you are farther or closer to any of my selections. I don't know if I will be able to afford any of them this summer, but I'm still planning. 10) Giza & Luxor (Egypt) - I put these on the list first, not because they are the least of the ten, but because these locations in Egypt are such an obvious choice. I suppose you could argue since Giza and Luxor are around 300 miles apart they should be listed as two different locations, but I cannot conceive of flying halfway around the world to Egypt to visit one, but not the other. At Giza the Great Pyramid and the Sphinx are iconic symbols of the fascinating, ancient civilization of Egypt. The Great Pyramid is also the last of the Seven Wonders of the Ancient World that are left standing. For thousands of years it was the largest manmade structure in the world. Luxor is the home of the great temple of Karnak and right across the river is the Valley of the Kings with its ancient royal tombs, including the final resting place of King Tut. Why are the sites at Giza and Luxor mysterious? Visitors continue to marvel about how the pyramids were made with a few people still arguing that aliens had to be involved. Rumors still fly about the "curse" of King Tut's tomb that has done in dozens of visitors, too. Come to think of it, perhaps I should wait on visiting the tomb until I'm already very, very old, just in case� A ten day trip through Egypt starting at Giza with a cruise up the Nile to Luxor can be had for about $1840 per person, including airfare from New York. 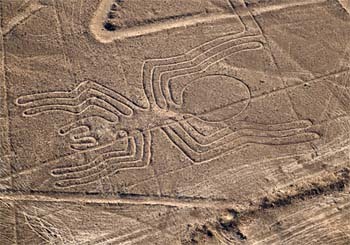 9) Nazca Desert (Peru) - Perhaps one of the most enigmatic locations in the world is Nazca where huge figures hundreds of feet across have been carved in the desert surface in ancient times. The symbols, sometimes in the form of animals and sometimes as abstract geometric shapes, were not rediscovered until the beginning of the twentieth century when airplanes allowed them to be seen from the sky. Although some claim these figures were carved into the desert to allow the ancients to communicate with alien visitors from other worlds, most archeologists think they are sacred symbols meant to be used to worship the gods. Nobody is sure, so there is a real mystery here. If you are already in Lima, Peru, (round trip from NYC can be had for $600) a flight over the desert to view the figures can costs another $600. A tour that would take you onto the surface of the desert to see ruins thought to be built by the same people that created the lines will be a bit more expensive, but probably worth the additional time and expense. 8) Stonehenge (Britain) - This prehistoric ring of giant stones and earthworks is thought to be about 4500 years old. Its construction has been credited over the ages to various agents including the wizard Merlin, prehistoric giants, the devil, and even alien astronauts. Engineers argue that the stones could have been moved using the primitive tools available at the time, but nobody is exactly sure how or why the work was done, leaving us a mystery. Scientists believe Stonehenge was constructed by a people with no written records leaving us with no direct evidence of what its purpose was so there is a multiplicity of theories. Even so, though, the ring clearly functions as an observatory and calendar as there is an alignment during the summer solstice and also with various phases of the moon. If you're already in England, Stonehenge is pretty easy and cheap to get to with many bus trips from London at less than $100. Or course the round trip airfare from North America to London this summer goes for about a grand. 7) Bomarzo (Italy) - This is a location not too many people will have heard of before unless you are an avid reader of this site. 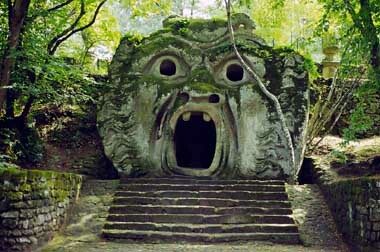 The town of Bomarzo is located about 70 miles North of Rome and has one of the most unusual gardens ever constructed. Often called the "Grove of Monsters," it includes horrifying statuary - roaring dragons, fighting giants, screaming orcs - carved out of the natural rock outcropping in the area. Built by Duke Pierfrancesco "Vicino" Orsini in the 16th century, then forgotten, the site has been restored in the last 50 years, but the reasons the Duke first decided to build it still remain a mystery. Round trip airfare to Rome can be had for a thousand dollars this summer. The best way to get to Bomarzo may be to rent a car and drive the distance. An overnight rental is about $100. The entrance fee to the garden is 9 Euros (About $12). Of course, if you are going to fly all the way to Rome you are probably going to want to stay awhile and that will greatly increase your costs. 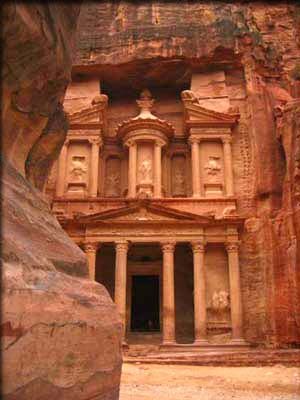 6) Petra (Jordan) - The "Lost" city of Petra has a history that extends back into biblical times. The Nabataeans, a nomadic people, settled in the area around the fourth century BC. This part of Jordan has been carved by erosion into steep, rocky gorges and the Nabataeans used the walls of the canyons to carve magnificent facades for temples and tombs. The most famous of these, the Khazneh, or Treasury, was used as the exterior of the temple housing the Holy Grail at the climax of the film Indiana Jones and the Last Crusade. In its heyday, the city was a hub of trade. Nobody is quite sure when and why the city was abandoned and its final years remain a mystery even today. Round-trip airfare this summer to Amman, Jordan is about $1500. A three day tour of Jordan, including a full day stop at Petra, is about $900 per person, though you can save a bit of money if you take a friend and share a room. 5) Machu Picchu (Peru) - If you are visiting the Nazca lines (#9), you might want to stop here, too. This abandoned city, perched high on a Peruvian mountain top, is perhaps the most well known of the ruins left by the ancient Incas of South America. At an altitude of 8,000 feet it was never found by the Spanish Conquistadors and was left untouched and undefaced. The population, however, was likely decimated by smallpox brought by the Europeans and the city was abandoned around 1572. Why it was built is a mystery, but it may have been the estate of the Incan emperor Pachacuti who lived from 1438 to 1472. The site was declared a UNESCO World Heritage Site in 1983. It is sometimes referred to as "The Lost City of the Incas." Access to the site is very good, though rains washed out the steep road leading up to the ruins in January of 2010, trapping about 2,000 visitors. The site was closed for a month until repairs could be made but should be open this summer. A six day trip to Peru that includes a day in Machu Picchu costs about $1400, but you will need to spend $600 for a round-trip to Lima from NYC to get you started. 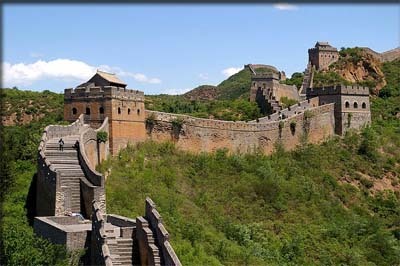 4) Great Wall of China (Peoples Republic of China) - One of the most spectacular sites in the world is the Great Wall of China snaking its way across the mountains. The first of the great walls dates back to 200 BC when the Qin Dynasty built a set of earthworks to keep out invaders from the north. However, the wall we are familiar with today, built of brick and stone, was mostly a product of the Ming Dynasty in the 15th century. The wall in many areas is about 25 feet high, 16 feet wide and has been restored in sections for the tourist trade. The total barricade with all its branches (if one includes earthworks and natural barriers such as mountains and rivers) stretches for some 5,500 miles. Perhaps the mystery here isn't so much the wall, but how the urban legend got started that it was the only man-made object visible with the naked eye from the moon. This idea was a staple of trivia in such publications as Ripley's Believe It or Not dating back to the 1930s. The reality is that even though the wall is thousands of miles long, it's only a couple dozen feet wide at most and it can't even be seen from low earth orbit without binoculars. A three day tour of China that includes a trip to the Great Wall at Badaling will cost you $450, but for that you also get to visit the Forbidden City and Tiananmen Square, too. Roundtrip airfare from NYC to Beijing is $1400. 3) Angkor Archaeological Park (Cambodia) - This site covers three different capitals of the Khmer Empire dating from the 9th through the 15th century. The most famous one, the Angkor Wat temple complex was built for the king Suryavarman II in the early 12th century as a state temple and capital city. It is a unique combination of the temple mountain architecture, the standard design of temples in Cambodia, and a plan of concentric galleries influenced by Indian culture. Its five central towers represent Mount Meru, the home of the gods. The surfaces of the complex are covered with a dazzling array of bas-relief figures and scenes from Hindu rituals. The park also includes Angkor Thom, the Bayon Temple and a number of lesser known ruins. The mystery here is an old one. Until the last century this scene was isolated from the coast by thick jungle. Westerners visiting the area would hear stories of fantastic cities and temples deep in the forest, but few ever set eyes on these sacred and mysterious ruins. Angkor Archaeological Park was declared a UNESCO World Heritage site in 1992 and their programs have gone a long way in preserving the park for tourism in a sustainable way. 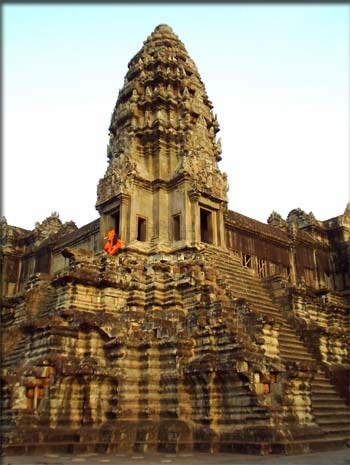 Airfare to Cambodia this summer runs $1400 with a 7 day tour of the country, including the park, adding another $1695. 2) The Acropolis (Greece) - Acropolis of Athens isn't the only acropolis in the world. The term means "upper city" and usually refers to the part of an ancient Greek town that was raised and fortified in case of war. However, because of its fame and the state of its preservation, almost everybody today associates the word with the ancient ruins located 500 feet high above the modern city of Athens. There were a number of temples and palaces located here before the structures we currently associate with the site were completed. 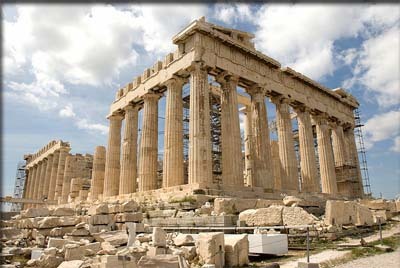 Then in the 5th century BC, under the leadership of the Greek statesman Pericles, the Parthenon was built. It was dedicated to goddess Athena andremains the largest example of a classic Greek temple that still stands. Though the ruins are themselves magnificent, they also allow us to imagine other even grander Greek temples that have now vanished. In particular, the temple of Artemis at Ephesus (one of the Seven Wonders of the Ancient World) was built on the same plan, but was much bigger, being as wide as the Parthenon is long. Though the Parthenon looks like a ruin, one of the mysteries is why it is in as good such shape as it is given its considerable age in a region that is plagued with earthquakes. It might have been in still better shape today if in the late 17th century an Ottoman garrison hadn't used it as a gunpowder store. Enemy cannons set the magazine on fire and the resulting explosion damaged parts of the temple. While the Parthenon is the most famous building at the Acropolis, it isn't the only one. There is also the Erechtheum, the Propylaea and also the Theatre of Dionysus, which lies at the base of the upper city. A guided walking tour through the ruins will cost about $70 and airfare to and from the city from New York goes for $1200. 1) Chichen Itza (Mexico) - Chichen Itza is a large, archaeological park containing the ruins of a city built by the Mayan civilization. It is located on the Yucat�n Peninsula in Mexico and contains a number of structures showcasing different styles of Mayan architecture. The city first came into prominence around 600 AD and became a major regional capital by 800 AD. 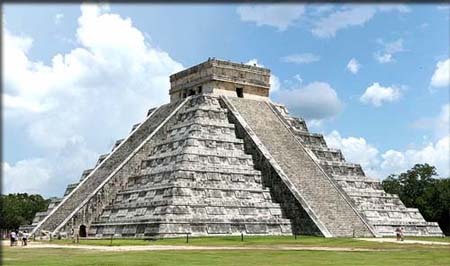 There are a number of well-preserved and reconstructed buildings on the site, but the most well-known is the Temple of Kukulkan (also known as El Castillo- "The Castle."). It is a stepped pyramid standing 100 feet high with a temple at the very top. The pyramid is oriented to the sun so that on the spring and autumn equinoxes shadows appear on it that look like a plumed serpent slithering down the side of the staircase. Also on the site is El Caracol, a Mayan observatory with doors and windows aligned to astronomical events, and the Temple of the Warriors, a complex consisting of a large, stepped pyramid flanked by rows of carved columns depicting warriors. There are a number of mysteries attached to the site, one of which is whether the Mayans intentionally designed their buildings to have certain acoustical properties. For example, if you stand at the base of the Temple of Kukulkan and clap your hands, the echo returns to you sounding like the warble of the Mexican quetzal bird, an animal sacred in Mayan culture. Were the Mayans smart enough to plan this, or was it just an accident? If you are already in Cancun, visiting Chichen Itza for a day will only set you back $50 or so. There is also a light show at night that will cost another $10. Round trip to Cancun from NYC is as little as $300, making this expedition one of the most reasonable.